Talc, Mica, Polyethylene, Ethylhexyl Palmitate, Magnesium Myristate, Dimethicone, Zinc Stearate, Boron Nitride, Sodium Dehydroacetate, Parfum (Fragrance), Lecithin, Phenoxyethanol, Caprylyl Glycol, Tocopheryl Acetate, Glycine Soja (Soybean) Oil, Tocopherol, Limonene, Bht, Retinyl Palmitate, Linalool, Hexyl Cinnamal, Benzyl Salicylate, Citral, Butylphenyl Methylpropional, Citronellol, Eugenol. [+/-: Ci 15850 (Red 6, Red 7, Red 7 Lake), Ci 15985 (Yellow 6, Yellow 6 Lake), Ci 19140 (Yellow 5, Yellow 5 Lake), Ci 42090 (Blue 1 Lake), Ci 45410 (Red 27, Red 27 Lake, Red 28 Lake), Ci 73360 (Red 30, Red 30 Lake), Ci 77007 (Ultramarines), Ci 77163 (Bismuth Oxychloride), Ci 77288 (Chromium Oxide Greens), Ci 77289 (Chromium Hydroxide Green), Ci 77491, Ci 77492, Ci 77499 (Iron Oxides), Ci 77510 (Ferric Ferrocyanide, Ferric Ammonium Ferrocyanide), Ci 77742 (Manganese Violet), Ci 77891 (Titanium Dioxide)]. Give your complexion a natural-looking glow that will leave you looking younger, healthier and more vibrant. Dust this sheer wash of color across your cheeks, forehead, and chin for a sunkissed radiance- it's a blush and bronzer in one! Blush & bronzer in one. Sweep the brush across the powder a few times and blow off any excess. Dust onto the apples of your cheeks, across your forehead near the hairline, down the center of your nose, and finish with a quick whisk across your chin. Use a slant powder brush for deeper color or a fantail brush for a more sheer finish. I absolutely love Dallas! I have a medium deep to tan complextion and I found this was perfect for my skin tone! After I highlight and contour my face and blend, I sweep this on the apples of my cheeks, forehead and chin. I love how it makes my face look, and it comes out more of a deep mauve color then a poppy pink. I never liked anything too bright and I found this was better than anything I used. It's soft and definitely gives that sun-kissed look. I would recommend it for anyone with an olive, tan, or medium deep complexion! by far one of my favourite products ever! Such a beautiful bronzed pink colour and is a great product to compliment cheekbones as well as a natural looking glow on cheeks. It's like a blush and a bronzed combined, long lasting, so worth the money and also a very easy and friendly product to blend. It does give me that sun-kissed rose glow cheeks! And I love it, I use this mostly on summer with my tan on. Here we go, another amazing product by Benefit. LOVE!!! This is by far one of my favorite Benefit products. I have a pale skin tone, and definitely did not think this would look good on me. I decided to be spontaneous and experiment with it, and it turns out it was the best thing that ever happened to me (in the makeup world, of course). I love the color, especially in the summer time. It gives my skin almost a bronzed type feel with a hint of blush. The sun-kissed glow I got from it was only more accentuated when I added Benefit's Girl Meets Pearl over it. I highly recommend trying the two together, you won't be disappointed! Yup, I'm one happy puppy!!! My newest blush/bloom/contour/whatever. Benefit doesn't really do stuff for my skin tone, except this. And this will be used till I can see what the bottom of the box looks like! Subtle glow, and the colour is perfect for my beige skin. It looks amazing. Okay first off, I think this stuff smells amazing!! Am I the only one? Haha! That's so strange. Anyway, the color payoff for me was awesome. It gave me a beautiful glowy tan look with a hint of sparkly sheen. It lasted forever as well! I just recently ran out and am waiting for a sale to go snag up another box! I LOVE this blush! I got it n a kit at sephora (which came with like 3 other full sized benefit products) and I am sooo surprised at the value of product for the money. Normally benefit is a rip... it charges you tons on a product that isn't even amazing and for barely any of the product. But the color is gorgeous, for a blush or bronzer ! I'm going to wear it as a blush when I'm pale. It's also 12 grams so it will last forever! I purchased this blush in the Benefit Beauty In a Box Set from Sephora. At first i didn't think this blush would suite me because i am very pale but I love it. In the box it's look very scary it look like a bronzer or a very brown blush but when I put it on my cheek it was a very nice dusty rose that suite my skin tone perfectly. 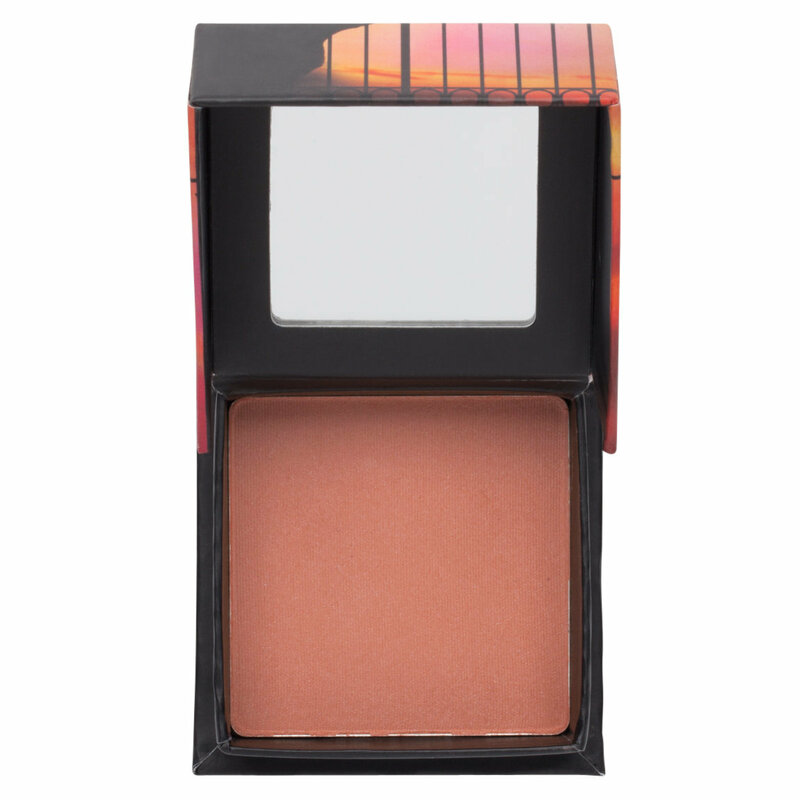 It is a very pigmented so be carful, just use a light hand and the blush should give a beautiful sun kissed glow. I love this powder for an all over glow, or even a quick eyeshadow. It's this amazing burnt brown with a dust of a red glow that gets better the more it's used! Great for an all over glow, a blusher, or even as a simple crease color when you're on the run. I don't think the image shown does it any justice, so ill try to post one later, but this a MUST try powder from benefit!